The AIChE Annual Meeting is the premier educational forum for chemical engineers interested in innovation and professional growth. Academic and industry experts gather yearly at this event to cover a wide range of topics relevant to cutting-edge research, new technologies, and emerging growth areas in the field of chemical engineering. The event is organized by the American Institute of Chemical Engineers and constitutes its annual conference. 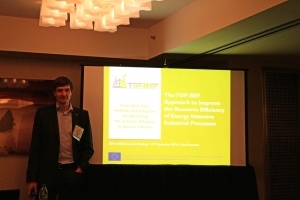 This year edition was held in the city of San Francisco, between the 13th and 18th of November. The presentation was scheduled within the session “Going to a Decision Point in Sustainability”, and raised great interest among the professionals that attended the conference. The audience was especially interested in the TOP-REF methodology and the first results, which showed an improvement of the exergy cost of about 10% for the case of the Fertilizer plant. In addition, during the discussion after the presentation many questions were raised, some of which were focused in the surrogate modelling and the validation of the results.